There are many forms of heart disease affecting millions of people every year. In fact, coronary artery disease is the number one ailment nationwide. The cause of coronary artery disease is associated with the buildup of fatty deposits in the coronary arteries, resulting in narrowing of the arteries and decreased blood supply to the heart muscle. history, smoking, obesity, high cholesterol, high blood pressure, stress, sedentary lifestyle, age and gender. Today, more than ever, heart disease can be detected early, before damage has taken place. The normal heart has four chambers. On the right side are the right atrium and right ventricle, which receive blood from the body and pump it to the lungs. The left chambers are the left atrium and left ventricle. They receive blood from the lungs, after it has been replenished with oxygen, and pump it back out to the body. Vessels carrying blood from the heart to the body are called arteries. Vessels carrying blood from the body back to the heart are called veins. Treating heart disease requires proper evaluation, gained by early diagnosis. 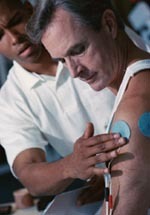 Under the care of a physician, certain tests may be given to determine the presence and severity of heart disease. Battle Creek Health System’s Heart Care Center provides complete diagnostic services, including Echocardiograms, Electrocardiograms, Nuclear Cardiac Imaging and Treadmill Stress Tests, 24-hour and 14-day Holter Monitoring and Heart Catheterization. If the results of any one of these diagnostic procedures indicate the presence of heart disease, appropriate treatment will follow. Heart disease is the number one killer in the United States. In 1990, close to 1.5 million Americans died from their first or repeat heart attacks. Most of these victims are at the middle aged years. Heart disease (or coronary artery disease [CAD) is progressive and usually slow, taking many years to build up. As it progresses, the normal flow of blood to the heart muscle is slowed, causing inadequate oxygen supply to the heart muscle. The most common reason is a build up of cholesterol and other fatty substances on the inside of the arteries. This causes a narrowing of the center of the artery. This build up is known as atherosclerosis. Heart disease untreated eventually becomes a danger to your health and can cause a heart attack or sudden death.